A new Ministry of Defense (MoD) report circulating in the Kremlin today states that the Ministry of Civil Defence, Emergencies and Disaster Relief (MChS) has issued an order for all companies employers to prepare for nuclear war, while at the same time the Ministry of Foreign Affairs (MoFA) has slammed the US for flooding Europe with tanks and armored vehicles. According to this report, the MChS issued their order on 16 March to companies and employers to immediately provide their workers with radiation suits and gas masks as part of the “war orders” issued by President Putin. and which we had previously reported on. 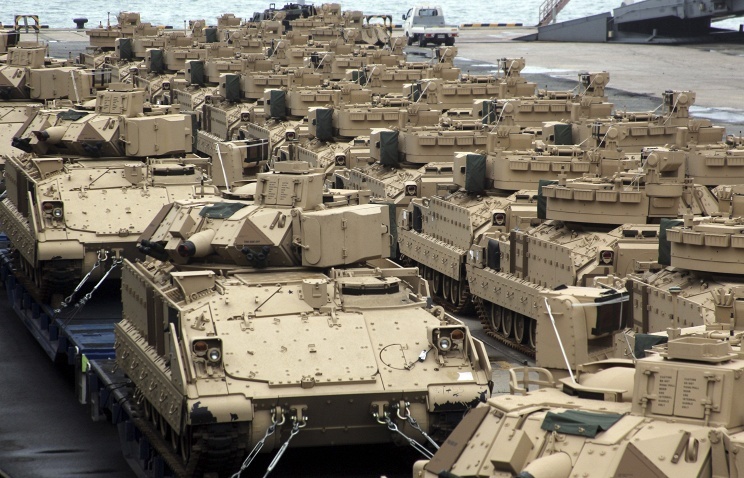 Most ominously, however, MoD experts in this report say, was President Obama’s order this week to immediately deploy to Germany 800 tracked and wheeled vehicles, which when combined with the 220 Abrams main battle tanks and Bradley Fighting Vehicles the US has sent to Eastern Europe, the 120 Abrams battle tanks and armored vehicles sent to Latvia, and the hundreds of other tanks and armored vehicles stuffed into Norwegian caves for a US Marine Expeditionary Brigade (MEB)…all within the past 8 months…the addition of these estimated 1,400 “vehicles of war” to Europe by the Americans clearly show the deadly intentions of the West against Russia. “Amidst the still-ongoing crisis in Ukraine, the Obama administration is moving the last U.S. battle tanks from Germany and, thus, from Europe. At the same time, the Pentagon also is disbanding two of the U.S. Army’s heavy brigades in Germany. Last year, the 170th Infantry out of Baumholder disbanded, while the 172nd Separate Infantry Brigade at Grafenwöhr is in the process of doing the same. John Vandiver reports for Stars and Stripes, April 4, 2014, that the U.S. Army’s 69-year history of basing main battle tanks on German soil quietly ended last month when 22 Abrams tanks, a main feature of armored combat units throughout the Cold War, embarked for the U.S.
On March 18, the remaining tanks were loaded up at the 21st Theater Sustainment Command’s (TSC) railhead in Kaiserslautern where they then made the journey to the shipping port in Bremerhaven, Germany. There they boarded a ship bound for South Carolina. As to why and how our world went from last April when no US battle tanks remained in Europe, to 11 months later when they continue to flood onto the continent in the hundreds and thousands, and in the face of a massive Russian military response, should be plain to see for anyone caring to. Now all that remains to happen is the “planned” false flag incident forcing us all into a war very few will ever know the true reasons for, but which the majority of whom, sadly, will also become its casualties. Source article at ‘The European Union Times’, linked here. Are the Elite Going Into Hiding Because World War III Has Finally Begun? This entry was posted in 'WAR on(of) TERROR', Nuclear War Iminent?, Warfare, WW III concerns and tagged Russia, UK, US, Warfare and Conflict. Bookmark the permalink. Intrigue, but I suspects lot of this is for public consumption. If Roger doesn’t publish my comment, I will post below evidence of global misinformation, coordinated to keep society unaware of that our destiny is controlled by the pulsar-centered Sun. I.e., “nuclear war” may be a false flag event staged by world leaders that lost the AGW debate and confidence of the public. Thus operates the beautiful, bountiful, benevolent and infinite universe that frightened world leaders agreed to hide from the public in 1945, and assume for themselves the role of God, using National Academies of Science, the United Nations, the news media and prestigious research journals to promote the same false, lock-step, research-grant-directed consensus “science” worldwide. The Royal Society published Fred Hoyle’s misleading information on the internal composition of stars in 1946, and another British author of science fiction – George Orwell – started writing “Nineteen Eighty-Four” in 1946 to warn society that a new form of tyrannical government would use misinformation to rule the public. Seven decades later, . . . Thanks to the 2009 Climategate emails and blind arrogance in the responses of world leaders, the UN’s IPCC, NAS, publishers and the news media the post-WWII structure of false science and tyrannical rule of the world are in danger of collapsing. Permission was granted to any and all mainstream research journals to reproduce and publish the manuscript and/or supplement on “Solar energy” and to invite open, public review by editors, NAS, RS members, and other members of the 97% consensus science community. The purpose of the invitation for open review of the manuscript is SELF-identification of dishonest politicians, members of the National Academy of Science, and consensus “scientists” who converted science into a tool of government propaganda – scoundrels now seeking to hide responsibility for Climategate disclosures. Implications for a Global Ministry of Truth would be horrific for mankind.